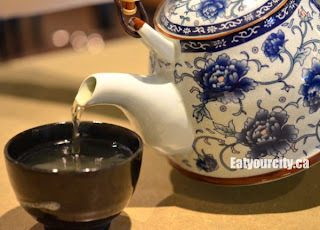 Eat Your City: Sushi Wasabi Edmonton, AB - Tasty fresh hamachi special! Sushi Wasabi Edmonton, AB - Tasty fresh hamachi special! We start off with our fav... I don't think there's been a time we haven't ordered this since we discovered this restaurant about a decade ago. 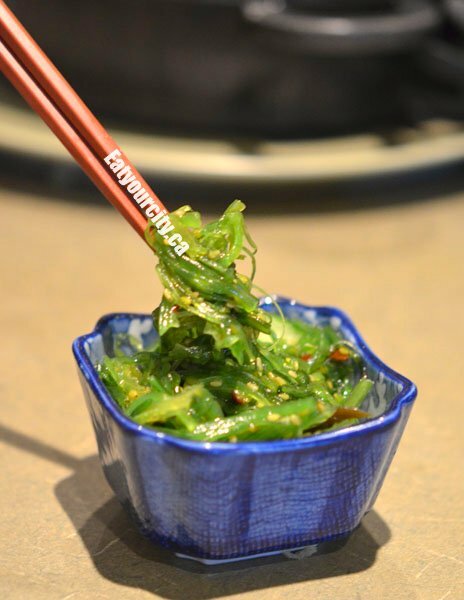 The wakame salad is made with small ribbons of fresh verdant green seaweed and marinated in their secret slightly sweet sesame oil and rice vinegar based dressing with just a small hint of chilis. We noticed the wakame wasn't cut as thinly as usual, and thus, the salad had a more chewy mouthfeel (different person prepping tonight? ), but garnished with thinly sliced cucumbers, this salad is still tangy and super addictively tasty! Our next appetizer was a platter of shrimp tempura. Lightly battered in their signature tempura batter, the shrimp is cooked to perfection, sweet and succulent inside. You can dip it in their tangy ginger flavored dipping sauce if you like, but they stand well on their own. The tails are left attached so you have something to hang on to, but they're usually fried to a crisp, so you can eat them too if you like. Next was our order of sushi nigri - salmon (Sake), scallop, and tuna (maguro) along with two orders of tekkamaki - small bite sized tuna rolls cut with precision. You can line them all up and they are (usually) all the same height. The sushi rice is well seasoned, with a hit of tanginess from the rice vinegar, working well to balance the slightly sweet-salty creamy pieces of tuna, scallop and creamy sweet salmon. Nom! Papa-san informed us that the more muscular back portion of the fish was to be dipped in a freshly grated wasabi and soy sauce, while the belly portion was to be dipped in his secret ponzo sauce laced with lots of grated diakon, toasted black sesame seeds, some diced green onions and a spicy mixture of Japanese spices. The back portion of the hamachi (hidden a bit by the head sorry!) had a stronger flavor and was much firmer than than the belly portion, thus working well with the stronger fresh wasabi-soy dipping sauce. The belly portions were sweet and had a more subtle flavor, standing well on its own, but quite tasty too dunked in the Chef's ponzo sauce. The fish was wonderfully fresh, taking on a silky silvery translucent sheen. Overall, yet another super tasty meal from Sushi Wasabi... and we waddled out yet again, without having any space for dessert, a small box of leftovers, and shouted thank you's from the staff. Gochisousama deshita!